I was lucky to grow up having two doting grandmas. Although they differed in their child-rearing ways, they loved me. However, my maternal grandma had no problem serving me a delicious cup of milky, watered-down Sanka. My paternal grandma didn't believe small children should be drinking coffee. She sternly told me so during a visit when she asked what I'd like to drink and my reply was, "Coffee with milk and sugar please." When I was five, we lived with my maternal grandparents while my folks looked for a house in the town my mother grew up in. I felt so grown up sipping my coffee and watching the morning news with my grandparents while my folks were running errands or getting ready for work. Sometimes I even prepared my coffee all by myself. I'd take the small orange Sanka packet and carefully tear it and watch the dark crystals collect at the bottom of my cup. Grandma would pour the hot water. I'd watch as the water magically turn a deep, dark brown. We added lots of milk and a spoonful of white sugar (before the days of Equal, Splenda, Sugar in the Raw and Stevia). Today, I still enjoy a hot cup of coffee, but thanks to my husband's obsession with the bolder the better, I can only drink dark and bold blends of coffee. However, a part of me longs for that little orange packet. Sanka was weak and today is no longer part of my morning routine. Though strong are the memories of the old house on Corona that stay with me always. 1. Sanka was 97% caffeine free. 2. Sanka was first marketed in the US in 1923. 3. Sanka was first served exclusively in two Sanka brand coffee houses in New York. 4. Sanka was a sponsor of I Love Lucy and The Andy Griffith Show in the fifties and sixties. 5. Coffee pots with orange handles can be found in diners all over America. Orange continues to symbolize "Decaf" because of our association with Sanka's orange packaging. Sanka is still available and sold under the Maxwell House brand. Find it here at Walmart. Check out a very young Facts of Life Charlotte Rae in the above commercial. *The above blog post does not reflect a connection with the Sanka brand or advertising in any way. wow! I've never known of anything beyond starbucks! Damn, I missed all the good stuff! This is a great post! I love the facts lol And now I know all about the orange handles! Great post. And I actually remember that stuff. I guess it means I am old. My parents let me have cafe aulait on the weekends, giving me a little of their Community coffee and putting in lots of milk and a teeny bit of sugar. Heck, we even had sugar cubes, lol! 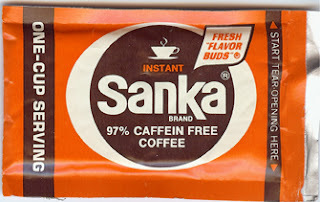 I had no clue Sanka was 97% caffiene free! I had actually forgotten about Sanka. Thanks for the memories! I love how in the second commercial you have here they so proudly sing "We're the 3rd largest coffee in America!" I mean, I know they explain the fact that they are the #1 decaffeinated coffee, but you just gotta love the fact that they belt out that they're #3! They could have probably fit in the same song phrasing: "We're the number 1 decaffeinated coffee in America!" Sure, it's a mouthful, but at least it says number 1! At the same time, I do appreciate how they were willing to be a little less precocious back then. My family is a long line of strong black coffee drinkers, so we would never have gone for the decaffeinated stuff. I'm the odd man out now (the non-black sheep, if you will) as I will only drink coffee with my cream and sugar - read VERY sweet! And I love Starbucks mochas and frappes, etc. decaf? might there have been a caffinated version I may have tried? See? I love your blog because it makes me remember and think! I forgot all about Sanka. Personally I never understood the point of decaf, because really what's the point? Ugh. I like Starbucks much better! I remember Sanka...I guess I'm that old. You have some blog love over at my place. Stop on by and collect! My mom once served (well, actually she did it many times) Sanka to a guest who accused her of serving him dirty water instead of coffee. I think he was kidding. It was probably served in those little plastic paper cup holders, too. Being in a Mormon family, we didn't drink coffee, but somehow Sanka was okay. So I grew up with that stuff and actually quite like it. You have to put a ton of cream in it though. Do you remember "Brim" also? Their slogan was "Fill it to the rim, with Brim." Looking forward to your next post.